Hey folks, our streak of exceptionally nice spring weather will continue another day as we will be warm and cloudy with rain holding off until this evening. This morning’s nippy temperatures in the low 50’s will become afternoon low 70’s under increasingly cloudy skies. Our streak of dry weather looks to end early this evening in the 6-9 pm range as some moderate rain showers move in with a weak cold front. Temperatures will fall rather abruptly into the mid 50’s as the rain showers arrive which will continue into the overnight hours. Fortunately, no risk for severe storms or flooding exists with this system, so you can breathe easy. Tomorrow, any lingering showers should clear up by the mid morning leaving us a cloudy but dry rest of the day with a high in the comfortable upper 60’s. Saturday looks picture perfect with mostly sunny skies and an afternoon high in the mid 70’s, so please try to make some outdoor plans to make the most of it. 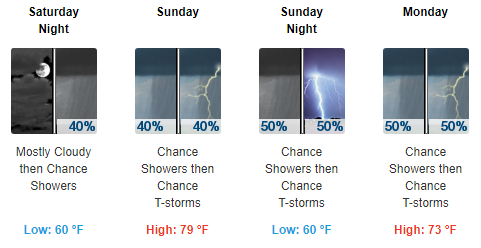 Rain returns late Saturday night leading to more chances for scattered storms on Sunday as high temperatures tickle a summer-like 80 degrees. It is a little early to talk about the potential for severe weather, but we will being keeping an eye on this chance for storms as Sunday and Monday approach. Have a great day, and follow @wxornotBG for the latest updates.